A former City of Asheville public works administrator says the stretch of South Charlotte Street where the city wants to develop hundreds of affordable housing units is “totally unfit” for that purpose. “You can’t build housing on it. It’s a swamp, a toxic swamp,” the retired staffer, who spoke on condition of anonymity, said. 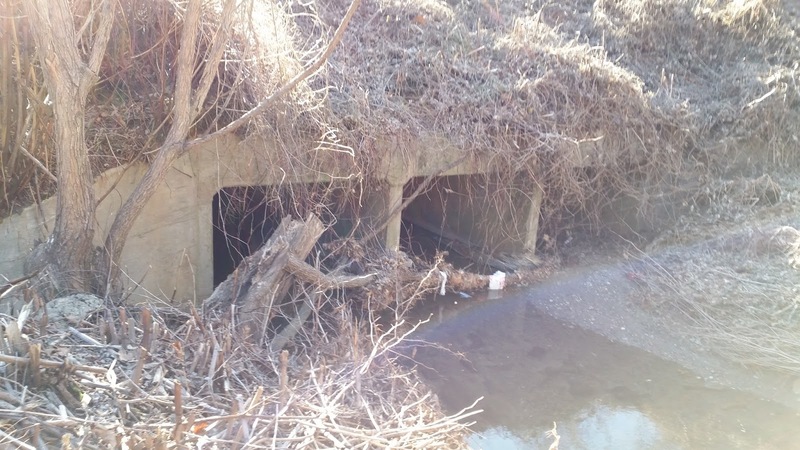 This culvert, said to be more than a century old, is located behind an office building on Southside Avenue. The culvert begins across South Charlotte Street (onve Valley Street) from the present Public Works building and tunnels underneath the property earmarked by the city for affordable housing development it wants to use bond money to pay for. In addition, the source said, the property is bisected by a massive underground culvert that may date from the 1890’s and is dangerously unstable. “Before it could be considered fit for people to live on, there would have to be a full environmental study and then a tremendous amount of money spent just to make it suitable to build on,” the source said. South Charlotte Street was originally Valley Street, a principal thoroughfare of the East End, Asheville’s main Black neighborhood. It ran uphill to the Black commercial and cultural hub at Eagle and Market Streets. Most of the area was razed during the city’s spasm of urban renewal in the late 1970’s, and Valley Street became South Charlotte. He tried to memorize each stereotyped movement of the delivery … wreaking his plan out among the sprawled chaos of clay and slime … Years later, alone in darkness, when he had forgotten the twisted anarchy of that pattern, he still remembered … a bank down which he had clambered to three rotting shacks, a high porched house into which accurately he shot his folded block of news. By that time, AU’s city source estimates, the wandering underground culvert had been in place for a generation. A major selling point of the City of Asheville’s $25 million “affordable housing” bond, passed by voters last November 8, was the proposed “repurposing” of city-owned property to accommodate construction of affordable housing units. As it turned out, the land the city had in mind was none other than the South Charlotte Street parcel occupied by the public works facility. The plan, as presented to the public, went something like this: the city would demolish the Taj Garage and construct a brand-new facility further down the street. The old site would be prepped and offered to private developers for construction of 400-plus units of affordable housing. The South Charlotte Street redo would take about $15 million of the bond, the city said. (The remaining $10 million would be earmarked for the city’s housing trust fund.) That figure includes the cost of constructing the new facility. So far there has been no indication that the city is aware of the condition of the public works property; or, if so, whether the city included the cost of a possible study and toxic waste cleanup in its overall bond budget. No mention of possible problems with the site was made during pre-referendum discussions. Councilor Cecil Bothwell voted against the housing bond, but his “nay” was based on more general concerns. In December Vice Mayor Gwen Wisler told members of the Council of Independent Business Owners the city had not even definitely decided to spend any bond money on South Charlotte Street, even though the project was specifically mentioned on the city’s website and in the bond proposal itself. “Specific projects we have not defined as yet, but we are looking at expanding what we may be doing around affordable housing,” Wisler said. Wisler’s hedging underscored a principal objection of those who voted against the bonds: the city is in no way bound to spend the bond moneys on any of the specific projects that it mentioned it might use the money for. So long as a given project can be made to “fit” into one of the three bond categories, money from that category may be used to fund it. Next: Asheville Unreported reaches out to city government for its response to the anonymous source’s concerns.